Thursday was packed full of fun! 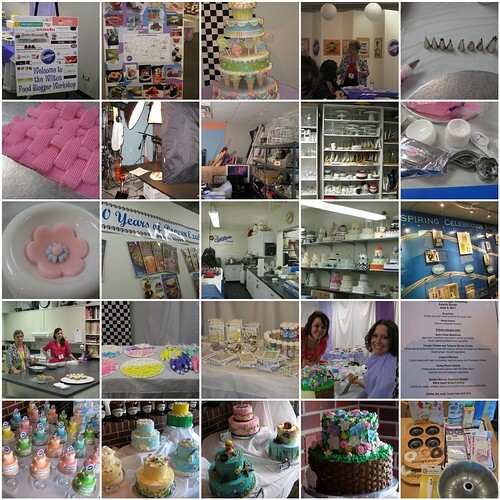 We learned about buttercream, tried out new products, took a tour of the Wilton decorating room and and photo studio, had lunch, learned about fondant (I need desperate help), then finally worked in teams to put our new skills to use in a decorating competition. I was teamed up with Kristy of Mommy Hates Cooking and Megan of Not Martha who were both wonderful teammates and didn’t laugh at my lack of decorating skills. Here’s Kristy and Megan hard at work on our basket weave flower bouquet. It’s also one of the rare times none of us had frosting somewhere on our clothes or in our hair. 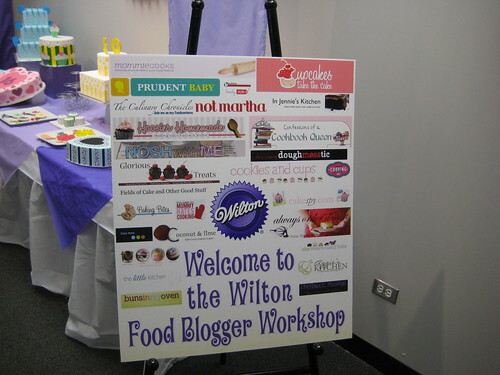 Following the competition, we boarded a bus and visited the Wilton School and Wilton Enterprises where we saw the history wall and visited the test kitchen (and ate cupcakes, naturally). From there we were pleasantly surprised with vouchers to spend at the Wilton tent sale. I got a ton of stuff, including doughnut pans (recipe coming soon), a bundt pan, bags, gel frosting, vanilla, a pastry wheel, and much more. It was like my birthday and Hanukkah all rolled into one! That night, we had an awards ceremony and dinner as a group, along with the Wilton folks. Each team was awarded a super cute [faux] cake, and our team won “Most Contemporary” for our basket weave bouquet. Thank you Wilton for inviting me, I had an amazing time! To see individual pictures, click on the mosaic then click on the links in Flickr. Did you and Jenn start crying when you walked into the Wilton Tent Sale, like the women do on Oprah’s Favorite Things shows? ‘Cuz that’s totally how I picture it in my head. Jenn was on a mission. As soon as we walked in, she was gone! Looks like so much fun and reminds me of my Wilton Cake Decorating Classes. Although I have to say, I only wish I had the icing bags and stacked cakes prepped like that whenever I went to make a cake. Such a fun and busy trip!! That sounds like a ton of fun. I’ve never done the basketweave, but I do occasionally use fondant. Time consuming and fun (though not the tastiest way to decorate a cake). Hilary, that looks like such a blast! I’m so glad you got to go, and your decorating was good no matter what you say! That looks like so much fun!! I’ve learned the basketweave thanks to my mom but there is so much more for me to learn! Sounds like a fabulous experience.